We present here a household income percentile calculator for the United States for 2017. Enter a household income and we’ll estimate which percentile it fell into, down to the closest .1%. The data was collected in the March 2017 ASEC, so incomes are for full-year January to December 2016. See more in our accompanying work on household income brackets in the United States. Also on DQYDJ: an individual income by age calculator and the standard individual income calculator. For net worth, try the net worth percentile by age calculator and the standard net worth bracket calculator. Note: the household income percentile calculator defaults to a logarithmic scale. The data can be extracted and downloaded from here: IPUMS-CPS. For household income percentiles, you should do no filtering whatsoever – merely remove duplicated serials, then compute weighted percentiles for HHINCOME. The final set contains 69,957 data-points representing an estimated 126,519,332 American households. Be very careful with the incomes near the top of the scale; expect them to be well off in either direction starting somewhere around the top 1% or .5%. What is the Cutoff to be a 1%er Household in 2017? Although we often argue that net worth is a better proxy for the “1%” (see our one percent in America article), most often the one-percent refers to income. To reach the 1% in 2017, an American household would have to earn $430,600.00. Roughly 1,265,193 households made that or more for full year 2016. It isn’t appropriate to make a .1% estimate with this rolled up household data (although there is a number in the tool). As the CPS is topcoded and already affects individual income estimates in an extreme way, assortative mating really breaks it for household income. However, the .5% number should be reasonably accurate. To be in the top .5% of American Householde, you would have to make $585,278. How Many American Households Made Between $100,000 and $200,000? Let’s work through “$100,000 to $200,000” together so you can (roughly – this is an estimate) answer questions of this type using the tool. Somewhere around 26,062,982 households in the United States made between $100,000 and $200,000. Please see the household income bracket article for full context. 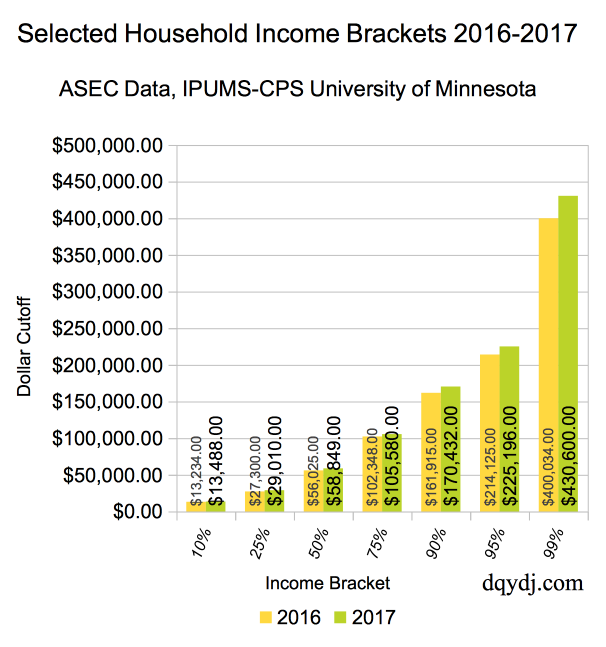 Here’s how selected household income brackets changed between 2016 to 2017. Remember, once again, that surveys encompass the entire previous year of data. You’re seeing ‘full-year’ 2015 versus ‘full-year’ 2016 in the graph. So there you have it – household incomes to the nearest .1%. Stay tuned for more cuts of income and net worth data, and be sure to subscribe.